This is the finished product of our AHR invites. They're on eggplant cardstock. 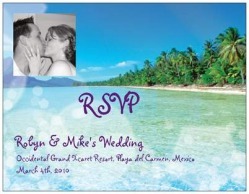 The invite part is raised a bit, and the words 'happily ever after' were stamped on and embossed. The love quote was embossed as well. The sand dollar is glue stamped on with a cream/sand glitter. 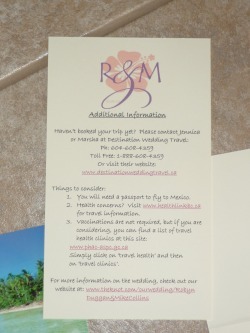 The "love laughter and happily ever after quote is on the back of the invite. This is my first attempt at my photoshare cards. I'm hoping to put them on everyone's plate at the dinner. 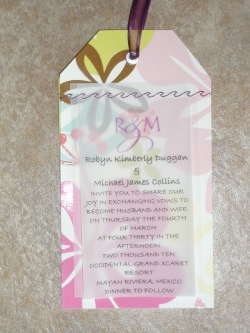 1. two luggage tag invites (1 for wedding and 1 for announcing at home reception) These were cut out of different designed fun travel-ly card stock. Two layers of vellum, are sewn on to the cardstock with a plum thread in a wave pattern. They have a silver eyelet at the top, and are looped together with ribbon. 3. A travel info piece of card stock (with our travel agents info again and pertinent info like "yes, you need a passport"
____ I'm packing my suitcase! ____ Regrets! I can't find my luggage! This is lovely wording I stole from a fellow knottie. If it was you, let me know and I'll give you credit. 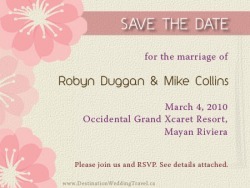 We did our save the dates via e-mail when we found out our resort. We had done an previous totally casual one also by e-mail. This one came with this pic and the info on how to book with our travel agents.